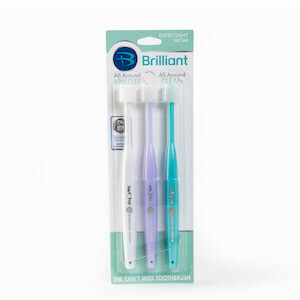 Share this product and receive a $3.30 sharing discount. 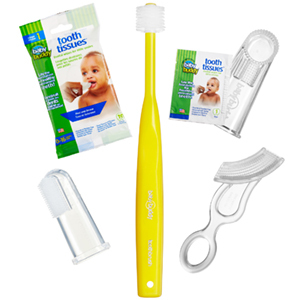 Our Baby Buddy Oral Care Kit for 0-24 months, or the first 2 years of life, includes five innovative products that parents and caregivers can use with their children as they grow towards independently caring for their own gums, teeth and tongue. Starting with the gentle, soothing Tooth Tissues® – an all-natural oral wipe – parents can step up to using the Finger Toothbrush and the Wipe-N-Brush with their babies and toddlers. 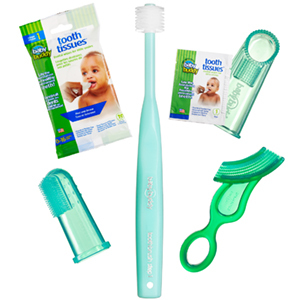 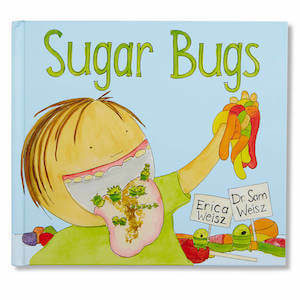 Once babies are ready for the Baby’s First Toothbrush, they can use it and manipulate it on their own with guidance. From there on, a transition can be made to the all-around Toothbrush, an intelligent advancement in toothbrush design that features state-of-the-art, circular bristle rings to effectively remove plaque and prevent build-up with regular use.The Brilliant Baby Toothbrush (Soft) leads to the pinnacle of the Baby Buddy Briliant Child Toothbrush which can be used until children can completely take the responsibility for their own oral care.